The Navy is seeking the public’s opinion on a proposed $20 million cleanup of 47 acres of Alameda Point that city leaders hope will someday serve as a town center with a mix of homes, businesses and parks. Comments will be accepted through May 31, and a public hearing on the plan is scheduled for May 15. 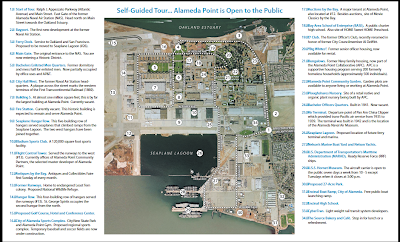 A vintage Alameda Point tour map. Back in March, we announced a fresh effort to bring a little more clarity to the subject of Alameda Point, and with that, opened up the floor for your questions on the former Naval Air Station Alameda. Today we've got the first batch of answers, with more to come. If you're looking for documents or more information on the Point, we've got two places where you can find those: the Alameda Point documents page on the city's new website and the newly redesigned Alameda Point Info, which contains a veritable trove of information on the Point. And if it's just the broad brush you want, read on. Ray Thackeray of the International Rescue Group said an attorney hired by the city e-mailed him to let him know the boat yard was being shut down and the gates locked this week. The city is in the midst of a massive planning effort at Alameda Point intended to prepare the city to consider actual development plans for the former Naval Air Station as soon as next year. It’s a departure from the planning efforts of the past decade, which were led by developers who had their own plans for the Point, but city staffers say it’s not an unusual tack for the city to take (Alameda Point Chief Operating Officer Jennifer Ott likened it to the just-completed city-led planning effort for Alameda’s former Auto Row, on north Park Street).